Please refer to our stock # TBD00216 when inquiring. 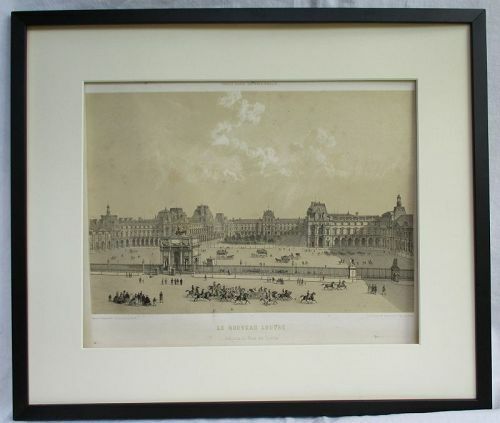 From a set of lithographs, Paris Dans sa Splenour, published in 1861, titled, “LE NOUVEAU LOUVRE/Vue prise du Palais Tuileries.” The printer and lithographer are shown in details of the lower left and right corners. The image without printing is 9 7/8 by 14 ½ inches (25 x 27 cm), the page 13 ¼ by 19 ¼ inches (34 x 49 cm). Condition; some rubbing to the surface and some of what look to be ink spots. New frame and acid free mat and backing.